The Save Radley Lakes delegation with Evan Harris (centre) in Downing Street. 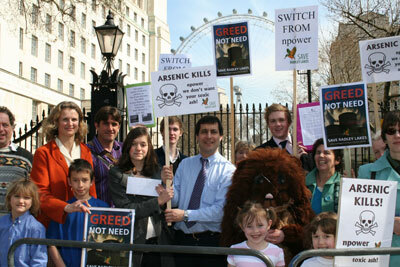 Accompanied by parents, and members of Save Radley Lakes, fourteen school-children and college students from Radley and Abingdon descended on No 10 Downing Street yesterday to deliver their own petitions to the Prime Minister, in an effort to stop RWE NPower destroying Thrupp Lake and turning it into an ash dump. The children’s petitions contained over a thousand signatures collected in under a fortnight – a tremendous achievement in itself. The delegation, comprising twenty seven people, was met in Whitehall by local MP, Dr Evan Harris. Just six people, in the company of Evan Harris, were allowed to go to Number 10 to present the petitions. They were: Annabel Eyres, William Summerlin (17), Arthur Laidlaw (17), both of Radley College, Eleanor Henderson (13) of The European School, Michael Lloyd (9) of Thomas Reid Primary and Archie McChesney (7) of Radley Primary. Two other children, Sophie Henderson and Fay Davidson, took it in turns to wear the water vole costume. Fay Davidson, aged 9, who has regularly paddled and swum in the Bullfield Lake at Radley, since she was a toddler, wore the costume for the cameras at Downing Street (above). The fact that these youngsters have, of their own volition, sent their own petitions to the Government, is an indication of the depth of feeling within the community about the Radley Lakes . They are the future generation, and they have expressed their disapproval of Npower’s plans for the Radley Lakes in the strongest possible way.